Q. When you rotate the lower element of a Zbeam® with respect to the upper element, how does it hold the angle? A. A large friction bearing is integrated into the axle assembly. If you apply approximately 15-18 foot pounds of torque, the lower element will rotate. With no torque applied, the lower element will lock to hold the angle. The friction bearing in the Zbeam behaves very much like an automobile sun visor. When you apply a force, you can easily adjust it. If you don’t apply a force, it stays put. Same idea, just on a larger scale. Although the heavy duty friction bearings on Zbeams easily retain their set pan angles, installations in places such as gymnasiums may have things like basketballs or volleyballs flying through the air which could strike a Zbeam and inadvertently change the pan angle. An accessory Lockbar Kit (product code LKB) prevents any possiblity of inadvertent change of pan angles. Q. I don’t have any architectural drawings for my current installation job. How can I determine the correct elevation angle so I can preset the rigging in our shop? A. You’ll need a digital inclinometer. They are available as digital levels for ~$60 at your local building supply store. The shortest possible size is best. Get a six inch torpedo level if you can find one. As shown in the drawing below, measure angle A2. Stand where you want the speaker to focus. Look along the length of the level and line it up to the desired speaker location. Use the ‘Hold’ button on the level to take the reading. If you’re using a torpedo level, hold a long straight edge against the level to take your reading. Angle A2 equals angle A1, the angle you need. Q. Are your products certified? A. The designs of our volume manufactured rigging products bear the stamp of a licensed structural engineer (defined by the state as Professional Engineer or commonly abbreviated as PE). Many people refer to this process as ‘certification’, but there is no legally defined or industry wide certification process for audio rigging products, or even general rigging products. In order for a product to be certified, it must be tested by an independent testing agency (such as Underwriter’s Laboratories) for compliance to an accepted standard, such as an ANSI standard. So far, there is no recognized standard for an organization like Underwriter’s Laboratories to test against. We are participating in the ESTA Technical Standards Program to help develop applicable standards. Q. Is the stamp of a licensed Professional Engineer (PE) in one state recognized in another state? A. There is a Reciprocity Agreement between the states in the U.S. to recognize the PE licenses issued in other states, just like Michigan will recognize a driver’s license from New Jersey. There is a similar Reciprocity Agreement between the U.S. and Canada for PE licenses. 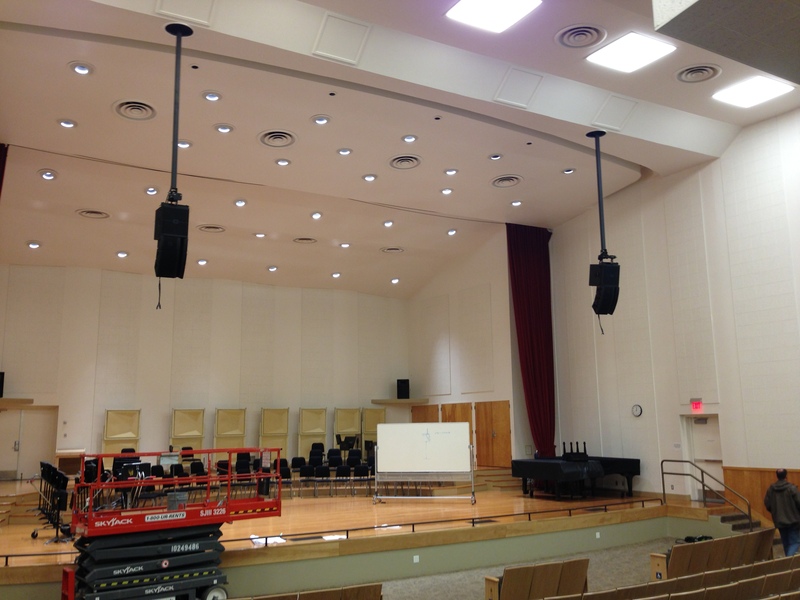 Q. I want to hang my trapeziodal loudspeaker enclosures sideways, and make them into a line array. Can you help me with that? A. No. A line array employs sophisticated physics and engineering to get some very special performance characteristics out of a sound system. Some of the factors involve the size of the drivers, the placement of the drivers, precision angle control between the adjacent enclosures, special DSP packages, and other complex factors. The guts of line array enclosures are radically different from standard trapezoidal enclosures. Or more succinctly, if you stand a hippopotamus on its hind legs, that will not make it a giraffe. Azimuth or Pan angle: The angle in the horizontal plane from a reference point. A compass measures azimuth in respect to magnetic north. Many architects measure azimuth in respect to the centerline of the room or building. Elevation Angle or Tilt Angle: The angle in the vertical plane from the horizontal. A loudspeaker aimed 15 degrees down would have an elevation angle of -15 degrees. Macro rigging: The rigging to suspend a group of loudspeakers, each individual loudspeaker with its own micro rigging. Micro rigging: The rigging to suspend a single loudspeaker. 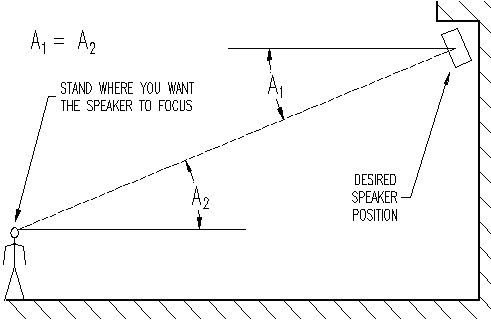 Row decoupled, decoupled: The characteristic where suspending one loudspeaker under another does not change the elevation angle of the top loudspeaker. rigging gear. Never exceed working load limits.